Enter to win one of the prize books offered above (Amazing Train Journeys; Love, Laugh, Bake! ; The Vineyards of Central Otago; and enjoy the pleasure of indulging in some bookish time out. Entry is only open to New Zealand residents who enter via the relevant website operated by TWR Media. Entrants under 18 years old must have parental/guardian approval to enter and the parent/guardian of the entrant must read and consent to these Terms and Conditions. If a winner is under 18 years of age, the prize may be awarded to the winner’s parent or guardian. Employees (and their immediate families) of TWR Media and companies associated with the specific promotion are ineligible to enter. 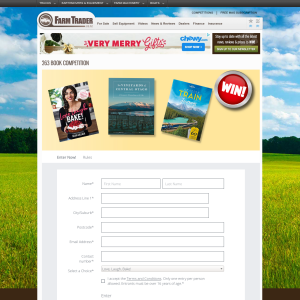 To be eligible to enter, individuals must, during the Promotional Period as shown on the entry page, visit the relevant website operated by TWR Media or with which TWR Media is associated, follow the prompts to the Win/Giveaway competition page, select the prize draw they wish to enter, and fill in the entry form (relevant to that prize draw) including their full name and email address and submit the online entry as instructed and before entries for that prize draw close. In the event that an ineligible entry is selected or TWR Media is unable to contact a winner within two weeks of the Prize draw, having made reasonable attempts to do so, TWR Media may deem that winner’s entry invalid and select a new winner on the same terms as the original Prize selection. Entrants may only enter once per prize draw. No prize is transferable, changeable, or redeemable for cash. In the event that a prize or any part of a prize becomes unavailable for any reason beyond TWR Media’s control, TWR Media’s publisher may in his/her sole discretion decide to provide an alternative prize. Neither TWR Media nor any other entity associated with any specific competition will be responsible for any late, lost, misdirected, corrupted, incomplete or incorrectly submitted entries, including but not limited to entries not received due to technical problems or human error. The time entries are deemed to be made will be the time the entry is received, not the time the entry is submitted by an entrant. TWR Media reserves the right to disallow entries in its absolute discretion and without giving reasons. By entering the Promotion, entrants agree to the use of their names, photographs, and likeness for promotional/advertising purposes, and agree to make themselves reasonably available for this purpose if so required. The ensuing copyright will rest with TWR Media, without any claim to compensation from the entrant. All competition entries become the property and copyright of TWR Media. By entering the promotion, entrants assign copyright in their entry to TWR Media. The winner acknowledges and agrees that he or she will comply with all instructions given by employees of TWR Media and other agencies associated with the promotion, and agree not to do anything that may bring TWR Media into disrepute. If a winner cannot accept or take part in the prize for any reason, that prize will be void and no compensation will be payable. If there is a dispute as to the identity of an entrant, TWR Media reserves the right, in its sole discretion, to determine the identity of the entrant. All decisions made by TWR Media its employees or agents are final and no correspondence will be entered into. TWR Media may amend, suspend or cancel any aspect of the competition (including any prize) at any time in its sole discretion. Except for any liability that cannot be excluded by law, as a condition of participating in a promotion, the winner indemnifies TWR Media, all organisers, sponsors and all other persons and organisations associated in any way with that promotion against all claims, damages, liabilities, costs and expenses (including legal fees on a solicitor and client basis) which the winners may incur arising out of their participation in the promotion and/or participating in a prize, howsoever caused. Failure to provide requested personal information may disqualify a person from being able to receive a prize.